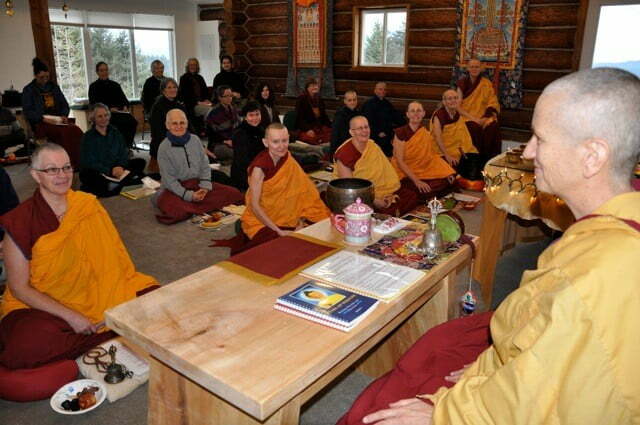 After attending teachings, visiting the Abbey for short retreats, and practicing for a couple of years, John Meienhofer from Boise did his first week-long retreat with Venerable Chodron at Cloud Mountain Retreat Center. He offers these reflections. Looking back on the retreat, I am pleasantly surprised at the way it went and offer the following commentary for potential future use for others considering the retreat. I really enjoyed the silence. I would say it is absolutely essential to the retreat. Compare for example all of the silence with the chat chat chat that occurred in the last hour and a half. It took my mind a lot of time to wind down. I am also not saying that my mind was in fact wound down. Rather, a lot of the noise of the first three days seriously subsided by the fourth day. I attribute a lot of that to the silence. I really enjoyed the discussion groups, and people were very respectful and followed the directives from Venerable to the letter. Nevertheless, they did lead to quite a bit of unnecessary chatter. The retreat focused largely on the big picture of gaining enlightenment over potentially many lifetimes. Therefore, any being that I have hurt I will have the opportunity to help and benefit at some point in the future. That thought alone inspires me to work very hard in my practice so that I can make amends. A one-week retreat, done seriously by any practitioner, will only underscore the absolute importance of actualizing the path, and the importance of daily practice. Nevertheless, any person who sits in the audience and thinks, “I really want to be a monastic,” needs to think about this decision very carefully, especially if they are “wanting to be a monastic” to get away from their job and their life. In my mind, as I sit in my office, my life is a piece of cake compared to what the monastics go through. Actualizing the path and working for the benefit of all sentient beings takes tremendous discipline and dedication daily. I see that now much more clearly than before the retreat. In contrast, working as a lawyer, I can easily get into cruiser mode and not really expend all that much energy. Also, I find that my mind wanders very easily. I am eternally grateful to Venerable Chodron and everyone else at the Abbey, and for that matter, anyone in a similar monastic tradition, that basically dedicate every waking moment of the day for the benefit of all sentient beings. I hope to gain that level of discipline and dedication in the future, and I will be doing more retreats. The Mahayana precepts really got me over the hump. To my surprise, I found food to be a bit of a distraction. Monday was actually my favorite day because of how little I ate and how much energy it gave me. I bet you’re thinking, “Why didn’t he just forgo the food for the rest of the week?” Well, here’s the honest answer: because it was there. I wanted the pleasure. I would suggest more Mahayana precepts days if it can be done in a way that doesn’t get other people cranky. In looking at myself in comparison to other people, I would rate myself as pretty high in terms of self-discipline. In comparison to the monastics, I am ridiculously low. So, I will make efforts to change that. The one-week retreat helped tremendously and I know I have a long way to go, but I will keep working at it. My meditation sessions since leaving the retreat have hit a new level and I am extremely grateful for that. Venerable’s teachings are changing my mind. She is an inspiration to me, and I have the utmost respect for the tremendous work she has put in so the rest of us can benefit. I don’t know how I will ever repay her kindness, but I will start by committing to practice the path every day for the rest of my life.